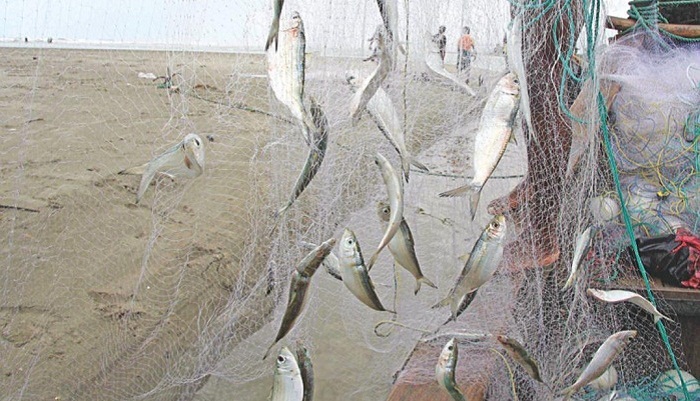 Fisheries and Livestock Minister Narayon Chandra Chanda on Wednesday said for violation of the recently imposed restriction on catching, selling and transporting hilsa the offenders will be will jailed for one or two years and fined highest Tk 5,000. The punishment will be doubled for committing the same crime for the second time, he said. Fisheries and Livestock Minister Narayon Chandra Chanda came up with the information at the conference room of his ministry on Thursday. The government has imposed a 22-day ban on catching, selling and transporting hilsa in a 7,000-km breeding ground to ensure the safe spawning of this popular fish during its peak breeding period. The decision was taken at a meeting of the National Taskforce formed to implement the ‘Mother hilsa protection campaign 2018’ held on September 23 as 22 days from October 7 to 28 is the peak period for mother-Hilsa to release eggs. The objective of the restriction from October 7 to October 28 is to save mother hilsa which lays eggs during the period. There will be a ban on catching of all kinds of fish in the rivers of 37 districts during the period, said the minister. At the meeting, the minister urged all, including the fishermen and the fishermen associations, to help make the countrywide programme a success.